As with most problems encountered both on a localised scale or across long lengths of pipe networks, many of the specific problems encountered are very dependent on the operating circumstances of the particular pipeline. Flows can be relatively neutral and many can be required to carry flows that generate, to some degree at least, corrosive environments in the form of Hydrogen Sulphide, Ammonia and other products that are produced in the atmosphere above the flow level. These atmospheres of course do not only affect the pipes themselves but can also often be a significant problem causing corrosion of the manholes serving the system. This is why the specific needs of the individual pipeline system have to be addressed when choosing the most relevant option for manhole or localised repair system. Whilst each individual repair technique has its advantages and disadvantages, if it is utilised in any inappropriate situation significant expensive and manpower could all be applied for nothing. As with many of the product types the cheapest renovation system may not be the most applicable to any given situation and the full spectrum of conditions will need to be considered before making a final choice. Knowing what expected flows are and what properties/characteristics they have is vitally important in this respect whichever system it is decided to use. In terms of manhole rehabilitation there are several technologies available that are applicable in various circumstances. These include some of those already mentioned in respect of pipe rehabilitation mentioned elsewhere on this website, including both localised and whole length situations such as: Re-pointing; Grout/resin Injection; Spray Systems; Lining with Pre-formed liners; Lining with Poured-in-Place liners; CIPP lining and Flood Grouting. Manual application of a mortar lining in a manhole. Damage in a manhole can occur in varying degrees of severity, yet one of the simplest repair solutions can be re-pointing of the brickwork or concrete jointing normally found as the basic manhole construction. Repairing the brickwork/joints of a manhole by re-pointing can be appropriate where any inflows are low due to low ground water pressures, inflow only occurs as weather conditions become adverse or where outflows only occur when the system is running at near capacity with the manhole running full. Simply repairing the fabric of the manhole in this way may be more than adequate to seal the manhole. However, this does not address the question of any voids that may have developed around outside the manhole structure due to the occurrence of such flows. If voiding is small in scale there may not be a problem, but if it is present in any significant degree simply re-pointing the inner wall of the manhole may be an inadequate solution. Where surface damage is deemed to be significant or where potential for such damage is likely, it is also possible to create a complete inner wall coating simply by manually trowelling a new inner lining over the whole manhole surface. Normally a cementitious grout would be used for such a liner. Its properties would of course need to be designed to suit the potential working conditions of the manhole. Where infiltration/exfiltration into or out of a manhole is higher and where the stability of the surrounding ground needs reinforcement without excavation, it is possible to utilise a grout/resin injection process. This is achieved by drilling a series of small injection holes around the manhole through the brick or concrete skin into the surrounding ground. A special resin or mortar is then injected through these holes to fill any voids around the outside of the manhole. This technique does not necessarily leave an obvious new inner surface or ‘lining’ to the manhole but it does prevent infiltration or exfiltration to or from the surrounding ground. There system does not offer any internal surface protection so the inner manhole wall may still need further protection if the circumstances deem it necessary. Of course grout/resin systems do not always require the product to be injected through or into the fabric of the manhole or manually applied to the manhole walls. Another utilisation of this type material may be as a sprayed ‘lining’ system. To use such a system first the manhole is thoroughly cleaned remove debris and to create a bonding surface for the sprayed compound to adhere to. Application of the spray lining can be achieved either manually using man-entry techniques or by using a spray system or a special ‘free acting’ remote-controlled spray nozzle of which there are various systems available to the market. 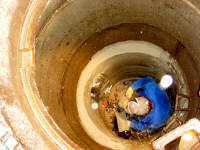 These remote access techniques also enable contractors to reduce the amount of time operatives have to spend in the manhole improving health and safety for the crews. A spray lining head for the rehabilitation of manholes. The sprayed product may be either a cementitious or polymer based grout depending on the criteria required of the lining and the preferred choice of the client. The spray system can be designed to be applied in as thick a coating as required or, as has been more recently developed, a multi-layered system with each layer being designed to achieve a particular characteristic within the aims of the rehabilitation requirements. Many of the systems available may require a level of manhole pre-treatment using some of the techniques mentioned already if infiltration is high simply to prevent the spray coating from being washed off/out before curing is complete. The coatings can be designed to give a range of curing times and final cured product, as required by the operations criteria of the manhole in question. As well as treatment of and to the existing inner wall of a manhole, it is also possible to install a physical material ‘liner’, which can offer either a simple new protective surface or, should the condition of the manhole require it, a degree of additional structural integrity without the need to completely rebuild the manhole. Various types of liner are available for such applications including: Preformed sections, Poured-in-Place linings and CIPP (Cured-in-Place) liners. Normally these liners can be installed within an existing concrete, brick, or pre-cast manhole. Preformed Sections lining, as in mainline sewer rehabilitation, comprises the use of factory-built units, either of standard dimensions or as a specially constructed design fitted precisely to the measured dimensions of the manhole undergoing rehabilitation. Liner sections can be constructed of concrete or plastic but are more usually designed from Glass-reinforced concrete (GRC) or Glass-reinforced plastic (GRP). The sections tend to be designed in single monolithic sections that are positioned within the manhole structure. Once in place the annulus between the new liner and the existing manhole wall is grout filled to form the permanent bond between liner and existing manhole, making the new lining an integral part of the manhole and so part of its structural integrity. Liner units are believed to be available for manhole depths from 0.9 m to 7.5 m, for manholes of inside diameters from 1,066 mm to 1,830 mm. However, most manufacturers should be able to supply non-standard units on request. Poured-in-place lining systems are very much self-explanatory. The technology relies on a formwork being placed in the manhole to be rehabilitated, that fits to the shape and size of the required lining. The formwork can be made of either steel or plastic material and is normally available in standard sizes or can be custom-made to specified dimensions. With the formwork in the manhole concrete or other lining material is poured around it into the annulus created between formwork and manhole wall, often using vibration to ensure the material settles correctly, until the annulus is fully filled. Once the liner material is full to the top of the former it is allowed to cure. Once cured the formwork is removed from the manhole to leave the new liner in place. If a plastic inner wall liner is required as a final product in the manhole, it is also possible to design a plastic skin that is placed around the outer surface of the former during its construction. The design allows for the plastic to anchor into the concrete as it is poured into the annulus, so creating an integrated concrete/plastic liner within the manhole. Manholes can also be rehabilitated using similar materials to those used in CIPP pipe lining. Inversion techniques are not however commonly used. Felt, PVC or Fibreglass liners are available for this purpose, that can be heat or ambient cured, depending on how each is installed and inflated. Where felt/glass-fibre resin liner material is used, it can be resin impregnated either at site for immediate use or under factory conditions and transported to site. With the product fabric chosen, the liner is inserted into the manhole under repair from the top of the manhole. Once in the manhole the liner is ‘inflated’ normally using some kind of flexible bladder that is itself inflated with compressed air. This pushes the liner against the existing manhole wall where it is cured. Once cured, the bladder is deflated and removed leaving the liner in place. Where it may be difficult to access the manhole and a bladder cannot be applied to inflate the liner into position it has been known that the liner is simple pressed into place by hand and left to cure. Again, a variety of systems are available for this type of rehabilitation, and given the nature of the liner materials and the lining that has to be achieved, liners are often ‘made-to-measure’ for each manhole to give the best possible liner for each circumstance. Once cured, the completed liner is cut in the relevant places to reopen the pipe and any lateral connections to reconnect the manhole fully to the pipeline network it serves. Flood grouting also works extremely well as a manhole sealing system. As in most cases the flooding of a pipeline occurs through existing manholes, so that when the flooding operation is undertaken, not only do flaws in the pipeline get treated but also those in the manholes. Should the system be used only for manhole rehabilitation inlets and outlets to the manhole would be sealed so that the flooding compounds would remain in the manhole only during the process. A schematic of a manhole collar expansion seal. Beyond the ‘full’ manhole repair techniques there are also developments which now enable certain parts of the manhole to be rehabilitated independently of the structure as a whole. One particular technique utilises the same technology as that used in the pipe repair section listed previously. That is the technique of the sprung expansion seal. In this instance rather than utilise the expansion seal in the ‘horizontal’ orientation it is used vertically, generally in the collar of the manhole. From one manufacturer, the rubber seals available with such a sprung expansion seal are varied in design so the best seal is offered for the particular circumstance. So, as with the main pipe rehabilitation systems discussed previously, it is again clear that the localised repair and manhole rehabilitation industries still have a lot to offer the pipeline contractor and that with a little thought and homework trenchless rehabilitation systems should be able to offers solutions to most pipeline deterioration problems, minimising the cost to the client, time spent on site by the contractor and the inconvenience of works to the general public and road users alike.